The best thing about this competition (well, apart from all the great food of course) is that there are no limitations… anyone who lives in Europe can enter. As long as we can send food products to your country, you can enter this competition. So whether you live just down the road from Japan Centre in London, or a remote village by the fjords of Norway, this competition is for you. The winner will receive one of every item that we have in our list of the 40 best selling items from all categories with a total value of approximately £100! Our top 40 items have been carefully pruned over the years by our customers to be the most delicious and useful Japanese ingredients available. Popular with everyone and a fantastic variety of different items, we are sure that you will find many things that you will love here such as noodles, rice, miso, tofu, green tea and rice crackers! * Please note that there are a few items from our top 40 that are not included in the prize for this competition. This includes currently out of stock items and large bags of rice. Some out of stock items may be replaced with similar items. Some items that come in multiple sizes are only counted once so all the items you receive will be different! We are feeling extremely generous this week so we even have some prizes for two lucky runner-ups too! Each runner-up will receive one each of the top 10 best selling items available at Japan Centre Online. • Only orders placed between 6pm on Wednesday 7th September and 11:59pm on Tuesday 13th September 2011 will be valid for this competition. Any order, no matter how large or small will be valid. • You must write ‘TOP40’ in the comment box which is located on the confirmation page BEFORE you complete your order. • Please check the delivery page of our website to make sure that your country is valid for us to be able to send food and drink products to. 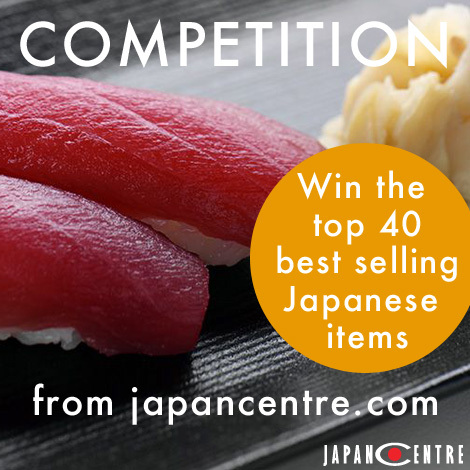 So, come and visit Japan Centre Online to place your order and enter into this competition. Good luck everyone!